August 20 is National Chocolate Pecan Pie Day in the United States. Pecan pie is a well-known specialty of cuisine of the Southern United States. Chocolate gives this famous dessert a new shade of flavor. The first recorded pecan pie recipes date back to the 1880s, but it had not started to become popular until 1940s. This dessert is a staple of the Southern United States. It is also often associated with holidays such as Thanksgiving and Christmas. If you don't want to wait until Thanksgiving to have a slice of chocolate pecan pie, you can bake it for National Chocolate Pecan Pie Day. Here is an easy recipe for you. In a small saucepan, melt 3 tbs butter. In a medium bowl, beat 3 eggs. Stir in 3/4 cup brown sugar, 3/4 cup darn corn syrup, 3 tbs bourbon, 2 tbs flour, and 1 tsp vanilla extract until combined. Add butter, 1 1/2 cup pecan nuts (halved), and 1/2 cup mini milk chocolate morsels. Mix until combined. Pour filling into a 9-inch unbaked pie shell. Place on a baking sheet and bake at 350 °F for about 50 minutes. Before serving, top each slice with a dollop of whipped cream. 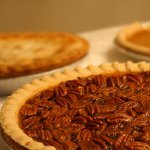 If you do not feel like cooking on this day, you can pick some pie at your favorite local bakery. Don't forget to share this delightful treat with your family!